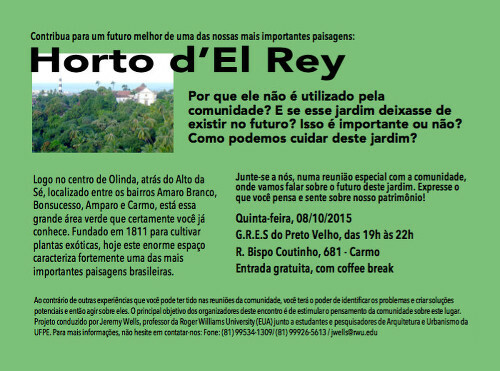 Advertising flyer for the first Horto d’El Rey community workshop meeting, prepared with help from students from UFPE. With much fanfare, I am pleased to announce that the first community workshop meeting on the Horto d’El Rey is finally happening on Thursday, October 8 at the G.R.E.S. Preto Velho in Olinda from 19:00 to 22:00 for residents of the Carmo neighborhood. My students from the Federal University of Pernambuco have been absolutely fantastic in helping bring this workshop to fruition. They have helped advertise the meeting though flyers and a loudspeaker announcement and prepare materials that the participants will use. I am very grateful for their help. Some of these students will also be helping to facilitate the meeting. Because of my limited Portuguese fluency, my students will be doing much of the work at these meetings with my role consisting of helping mentor them through the process and providing training. Because I will be at these workshops, I am also available to help with the overall process and support my students’ work. How is the garden important? What are threats to the garden? How should the garden be used? How can the meeting participants act on these solutions? I am also grateful that the owners of the Horto d’El Rey property have both agreed to allow this study to proceed and are also interested in participating. In addition to the residents of the neighborhoods around the garden and the property owners, the Brazilian federal government and the city of Olinda are also significant stakeholders because the garden is protected by law from certain changes because of its association with the World Heritage site of Olinda.